There's no doubt the Milwaukee Jobsite Tech Bag gets my Pro approval. At $99, this is a storage solution that the electrician, plumber, or anyone else needing to store and organize hand tools will be glad to have at his disposal. Most of the time, I’m happy to give the other guys on the team the first shot at new products that they’d like to review. Once in a while, something hits my inbox that I immediately claim as mine – hands off, no negotiating, Managing Editor point of privilege. That’s exactly what happened when I saw the announcement about the new Milwaukee Jobsite Tech Bag. Storage options like Milwaukee’s Jobsite Backpack are easy to store themselves and can be packed with a specific grouping of tools so you don’t have to think about what’s in it. When I saw the new Milwaukee Jobsite Tech Bag, I immediately started planning the next go bag scenario. With electrical covered by the backpack, it seemed natural to start building a plumbing kit. I’d need adjustable wrenches, Sawzall blades, maybe even a Cheater Pipe Wrench. And that’s just the beginning. I started thinking of all kinds of hand tools and accessories I might need. Fortunately, there’s plenty of space. That’s when it hit me – I’ve become a tool prepper! I love Milwaukee’s Jobsite Backpack. It’s tough, durable, and functional. It looks like the Milwaukee Jobsite Tech Bag is following suit with similar materials put together with a different design. It all starts with 1680D ballistics material and heavy duty zippers that will hold up to tough conditions better than others. MIlwaukee didn’t get cheap on the hardware for the Jobsite Tech Bag. The unsung hero is the hard molded base. I don’t have to think about how or where I’m setting the bag down. No water gets through it and it doesn’t tip over or sag like some of the other bags on the market. A hard molded base keeps the bag from tipping over and water from seeping in. The Milwaukee Jobsite Tech Bag is put together in a rectangular prism shaped shoulder bag with features everywhere you look. With central and fold down front compartments included, 55 individual pockets and straps (Milwaukee counts 53) are available to store and organize a variety of tools and accessories. Working from the outside in, there are 2 open pockets, a medium zippered pocket, and a handy metal D-ring on the exterior. On the sides, you’ll find a pair of deep pockets with an elastic band – perfect for carrying a couple of water bottles. A padded rear outer pocket provides storage for a laptop or tablet that’s separate from all other compartments. You’ve got roughly 14 inches width to work with, which should handle laptops up to 16 inches diagonally (15-inch screen size) with relative ease. Unzipping the fold down section reveals 12 small pockets, 3 medium pockets, and 6 elastic strap points. In the short term, these are great for holding down a variety of tools, like screwdrivers. Long term though, the elastic will likely stretch. 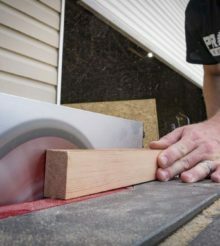 The front fold down section is the perfect place for your smaller hand tools. With it fully opened, it is much easier to see which tool you’re grabbing. The main compartment features 6 small pockets and 3 medium. On the left side, you’ll find a new pocket with rigid construction that should offer additional protection from the tools inside your bag. I like the idea of it, however I’d really like it to be about twice the size to hold electrical meters (even though this is currently my plumbing bag). You’ll also find a total of 18 elastic strap points in here. On the top of the cover is a puncture resistant bag, perfect for storing sharp accessories. There’s plenty of space in the main compartment to even carry 12V tools and accessories. At first glance, it looks like there’s space in the center to handle a variety of hand tools and still fit your Milwaukee One-Key combo kit in there. At the least, you’ll be able to fit one of the tools. The interior main compartment works great for the larger tools, giving you just over 15 inches of depth to work with. My larger, more easily identifiable tools live here. I am indeed able to carry a cordless kit in the main compartment – it just happens to be my M12 Fuel kit instead of an 18V. The nice thing is I have the ability to carry both the drill and impact driver along with the charger. Given the tech carrying nature of the bag along with where it’s designed to be taken, Milwaukee integrated a rain fly in the design to help keep moisture sensitive items from getting wet. This is tucked below the tech storage compartment and zipped inside until you need it. The rain fly is a really nice addition that covers the main compartment and tech pocket very well. I had a hard time getting it to keep the top of the front compartment covered though. It looks like it’s probably not designed to considering that the sides are still exposed. Just be aware that the front section won’t be protected. The rain fly is an outstanding addition to keep the tech and main compartments dry. The padded shoulder strap is definitely the carry method of choice. It didn’t take long to work around the Milwaukee Jobsite Tech Bag and decide that it’s built for the long haul. The Nothing But Heavy Duty construction comes at a weight cost though. At 6.9 pounds, it’s going to start getting awfully heavy as you add tools. Fortunately, Milwaukee included heavy duty carry handles that are doubly reinforced to carry by hand. Additionally, a heavy duty adjustable shoulder strap with cushioned sliding sleeve is also in place. I found that I’d carry by the shoulder strap 90% of the time. Milwaukee probably could have gotten away with knocking a couple of inches off the top of this bag. However, by making it the height they did, the Milwaukee Jobsite Tech Bag gains some versatility that Pros with larger hand tools will appreciate. Build quality is outstanding – the soft material and hardware Milwaukee chose is absolutely on point. While I’m concerned about the long term function of the elastic straps, the bag will continue to be relevant even without them. There’s no doubt the Milwaukee Jobsite Tech Bag gets my Pro approval. At $99, this is a storage solution that the electrician, plumber, or anyone else needing to store and organize hand tools will be glad to have at his disposal. If Milwaukee’s Jobsite Backpack is more your style, Acme Tools currently has it on sale for $79. Excited for the review on this and to see size comparisons. I currently just keep all my most used tools in a Milwaukee canvas bag. No organization even possible. This may be the answer.